Johnson said the Brexit “dream is dying, suffocated by needless self-doubt”, days after the Tory cabinet had appeared to agree to support Theresa May’s Brexit plan. “We are headed for the status of a colony,” Johnson declared in his resignation letter. 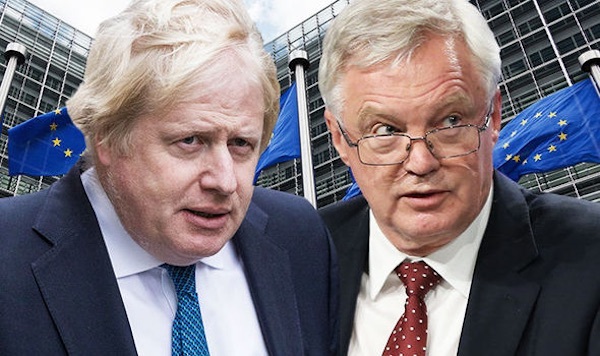 In his own letter, Mr Davis (pictured, right) said he did not “believe” in the Brexit plan and he was not the best person to deliver it. Prominent Leave campaigner Dominic Raab has been appointed to replace him. Speculation continues that internal discontent by Brexiteers could lead to an early vote of no confidence against Theresa May. However, at a meeting this evening of the ‘1922 Committee’, the parliamentary group of the Conservative Party in the House of Commons, May was reported to have received “strong backing”. The committee has not said that it has received the necessary indication from 48 Tory MPs to trigger a motion of no confidence, meaning that under parliamentary rules, May’s leadership is secure for now. However, the conflict seems far from over, and the trickle of resignations continued this evening with the departure of Chris Green, Parliamentary Private Secretary to the British Department For Transport. Conor Burns MP, Parliamentary Secretary under Boris Johnson, has also quit. Uncertainty remains about the stance of other senior Brexiteers, such as Liam Fox and Michael Gove. Even if the current wave of dissent comes to nothing, the fate of the Irish border hangs in the balance amid doubts over the detail of May’s Brexit plans. Sinn Fein’s Mary Lou McDonald has said that Ireland must not become collateral damage amid the Tory ‘civil war’. The Sinn Fein president was speaking after meeting business leaders in Belfast. “Our sole priority is the protection of Irish interests north and south,” Ms McDonald said. The Sinn Fein leader also warned that Britain should not “persist with a strategy that is about brinkmanship”. “We need an answer to the Irish question, Europe has provided that answer by way of the Irish protocol [maintaining the current border regulations by default]” she said. “Mrs May seems still to be at sixes and sevens and is causing confusion in terms of what her and her Government’s position is. Asked for her view on the Chequers deal, Ms McDonald said it appeared to be selective about the freedom of movement of goods. She said she would await the publication of the British government’s white paper. “But all of this gets set to nothing if Mrs May insists the north of Ireland must exit the customs union and the single market. “You can’t make that assertion on one hand, and on the other hand insist that you will ensure there is no hardening of the border and protect the Good Friday Agreement.